Kate and Chelsie: Quirky Must Try Find Pashmak, Persian Candy Floss! Quirky Must Try Find Pashmak, Persian Candy Floss! 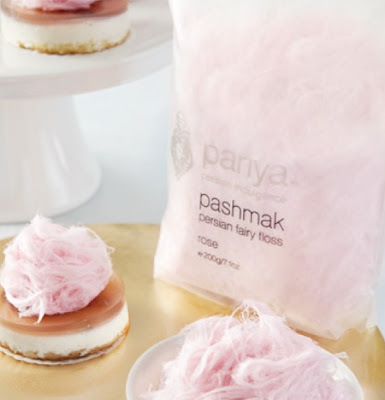 Embracing the culinary delights of ancient Persia, Pariya Foods bring us this mouthwatering confectionary to enjoy! 'Pashmak' is the Persian word for candy floss (cotton candy in the United States) and comes in four delightful hand made flavours; Rose, Saffron, Pistachio, Orange blossom, Vanilla and Chocolate. Pashmak originated in the Iranian city of Yazd known for its array of traditional Persian sweets. Pashmak is spun from sesame and sugar, and can be served on its own or alongside fruits, cakes, ice creams, puddings and desserts. 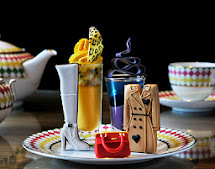 I discovered Pashmak for the first time at the Jumeriah Carlton Towers (London), whilst enjoying their afternoon tea. I was instantly drawn to it's uniqueness, and without doubt it was the item I wanted to try first! If like myself you are looking for something a little different, flavoursome and ever so slightly naughty then Pashmak is for you! I have subsequently become somewhat addicted, and tried all of the flavours but without doubt my favourite flavour is Pistachio. I heartily recommend you try! Click here to Buy it online or, if you’re in the UK head over to Selfridges or Harvey Nichols and find Pariya’s pastel-colored packages in the confectionary section. That neon pink stuff you have previously bought at the circus and local fun fairs, alas will not match up!